So it is forged, a Science Fiction saga that gave birth to a legend, a tale about the life of a man with one project that will change mankind’s future forever. Ten stories about his life, his sorrow, and his quest to gather the resources and the people needed to claim our place among the stars. This is definitely an original, nail-biting read! This book was fascinating with all the characters, twists and the extremely well-written plot. 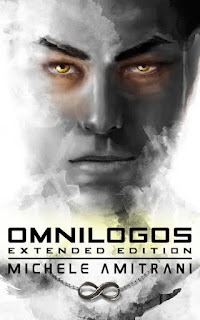 Omnilogos is about a 21st century Einstein, named Wei Wang. Ever since Wei was a little boy, he wanted to make a difference in the world by bringing science fiction to life. In this book, there are multiple perspectives with each tying in to the plot wonderfully! This book gets more intense as you read on. My favorite character is Evangeline because she is smart, brave and most of all, stubborn. She is so stubborn that she can even make Wei Wang afraid. My favorite parts are when Wei Wang makes all of his jokes. I cannot wait to read the next book in the series. Michele Amitrani did an extraordinary job with this book. I would definitely read more by him! I recommend this book to people who enjoy a nice long novel that keeps you guessing with each turn of the page.